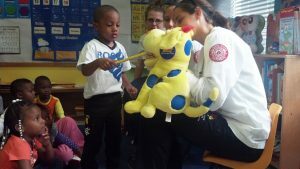 America’s Promise has brought Illinois State University nursing students to local schools to help improve oral health. Standing in front of a room full of teachers, one with her arms crossed, telling them it was important to get their first-graders to brush their teeth every morning, wasn’t easy. But that’s what Shelly Malin and her team did, after oral health was named McLean County’s top child health care concern. Malin is director of the America’s Promise School Project, which provides oral health education in 28 Central Illinois schools. State Farm Companies’ Foundation provides the funding for the program, which began in 2011 and provides valuable clinical experiences for Mennonite College of Nursing students. The teacher with the folded arms became one of the program’s biggest advocates. For the past six years, America’s Promise has brought nursing students to local schools to help improve oral health. Nearly 21 percent of third-graders have untreated cavities. Tooth decay not only affects eating and sleeping but is the primary cause of school absences and can lead to more serious ailments, such as pneumonia and heart disease. Grade-schoolers in the program pull out their toothbrushes and squeeze a finger of fluoride on their brushes every morning, scrubbing for two minutes. They love it, Malin said. America’s Promise meets one of Mennonite College of Nursing’s needs as well. With the nearest children’s hospital 45 minutes away, and 600 undergraduate nursing students, there was a big demand for clinical sites for pediatric and public health rotations. Hospitals only expose students to the most seriously ill children, not those who deal with chronic health problems such as asthma or diabetes. Tooth decay not only affects eating and sleeping but is the primary cause of school absences and can lead to more serious ailments. Under the leadership of former MCN Dean Janet Krejci, now provost and vice president of Academic Affairs, a partnership was formed with State Farm, the McLean County Public Health Department, and area schools. McLean County is home to Bloomington-Normal and Illinois State. Nursing students also offer educational and mentoring programs on self-care, self-esteem, obesity prevention and healthy living. Graduate students do health assessments and interventions, working closely with school staff. Yvette Pigman, M.S.N. ’14, an MCN instructional assistant professor, has been involved in the oral health project from the beginning, leading the pilot project to determine the feasibility of brushing in the classroom. As she finishes her doctorate, her capstone project is designing a toolkit for schools. The latest McLean County community needs assessment spotlights a health problem that has topped oral hygiene—mental health. Malin and her team were prepared for that and have already piloted a program to address it through America’s Promise. Related Article: MCN dementia research Mennonite College of Nursing faculty conduct dementia research at retirement community. Last January, she and MCN Assistant Professor Carla Pohl piloted Project Happiness, which teaches grade-schoolers social and emotional resiliency. MCN provided education, training and materials for the school nurse at Fairview Elementary School in Normal, with additional support from nursing students. The program was so successful that Principal Lori Harrison asked if it could be expanded to fifth grade. This fall, it will be implemented schoolwide. “We have loved the program,” she said, adding they’ve already seen positive results. A weekly “happiness circle” was developed for staff. In June, America’s Promise hosted the fifth annual School Nurse Summer Institute, bringing in regional experts on hot topics, including obesity. MCN supports school nurses throughout the year, participating in health fairs, running a recess club and providing vaccination education.